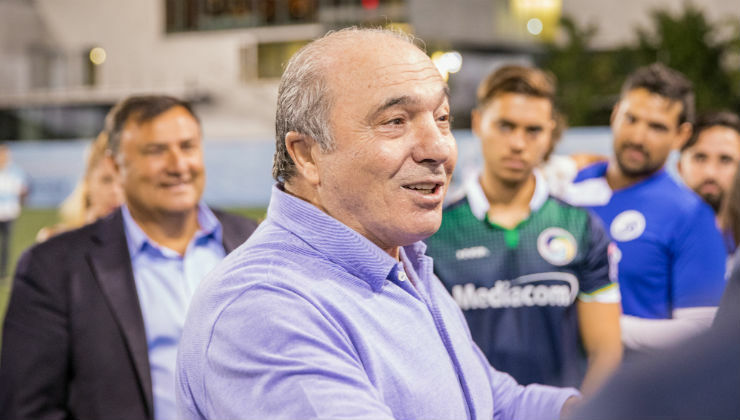 New York Cosmos owner Rocco B. Commisso will be inducted into the National Italian American Sports Hall of Fame in Chicago Saturday, Nov. 3. Commisso, the founder and chairman and CEO of Mediacom, will be inducted alongside former New York Yankees manager Joe Girardi, Mixed Martial Arts legend Gina Carano, and long-time Illinois high school basketball coach Gene Pingatore. Some of America’s most recognizable sports personalities will join the celebration, including Tommy Lasorda, Ray “Boom Boom” Mancini, and Mike Piazza. The 41st annual induction ceremony will be held at the Hyatt-Regency hotel in Chicago. Commisso, who took over the Cosmos' reins in January 2017, forged his reputation in the beautiful game at Columbia University. “We are extremely proud of Rocco’s induction into the National Italian American Sports Hall of Fame,” former Columbia star soccer players Amr Aly and Charles Balsamo said in a statement. “Rocco has secured his rightful spot of this over the 40-year old institution." They noted Commisso was joining other great Italian sports figures, including Joe DiMaggio, Vince Lombardi, Mario Andretti, Phil Esposito, Bobby Valentine, and Jim Valvano. Peter Pilling, the Campbell Family Director of Intercollegiate Athletics and Physical Education at Columbia, was just as effusive about the Cosmos owner. Commisso began his Columbia career in 1967. After growing up in Calabria, Italy, and migrating to New York at the age of 12, he went on to earn All-Ivy League honors three times. Commisso captained the Lions' first NCAA Tournament appearance as a senior in 1970 as the team finished 9-4. After his 1971 graduation from what is now the Fu Foundation School of Engineering and Applied Sciences, Commisso began his career at Pfizer. He returned to Columbia Business School to earn his MBA in 1975. After working at Chase Manhattan Bank and Royal Bank of Canada, Commisso became the Executive Vice President, CFO, and Director of Cablevision in 1986. Commisso grew Cablevision from the 25th largest cable company in the country to the eighth, with more than 1.3 million customers before its merger with Time Warner. In 1995, Commisso took a giant leap when he founded Mediacom Communications Corp. with the goal of bringing advanced communications services to underserved American communities. Commisso led Mediacom’s initial public offering in 2000, and then took the company private in 2011. Today, Mediacom boasts more than 4,600 employees, and is the fifth largest U.S. cable company serving 1.3 million customers with annual revenues of $1.4 billion. Along with his business acumen, Commisso has stayed close to the Columbia program while becoming a fixture in the New York City soccer scene. He served as the chairman of Friends of Columbia Soccer from 1978-86, before the school’s home venue was named in his honor in 2013. He also was honored at the New York City Soccer Gala in 2015.